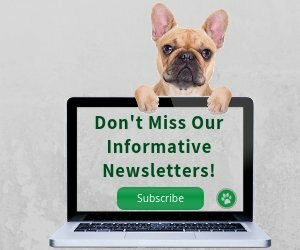 What Causes Excessive Dog Licking? If a dog keeps licking himself excessively, it may mean that the dog is suffering from some underlying physical or emotional problems. 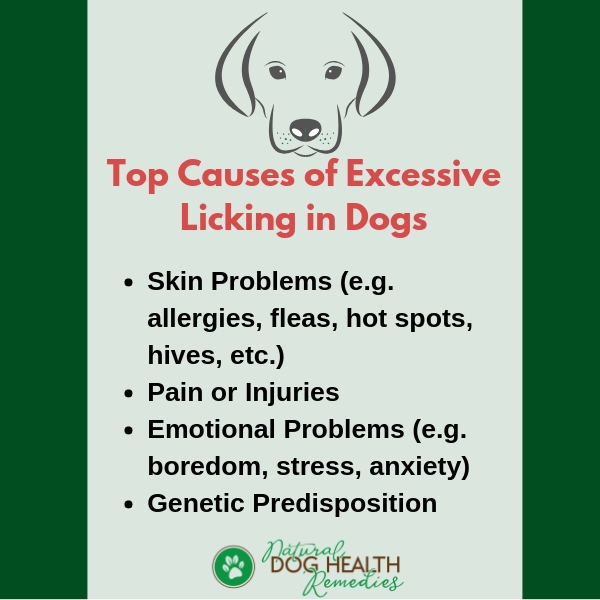 For this reason, it is important for dog parents to understand some of the possible causes of excessive licking in dogs. If you cannot figure out why your dog keeps licking himself, it may be a good idea to take him to a vet for a check-up. Only by properly identifying and tackling the underlying cause can we stop our dog from licking, chewing, and scratching himself excessively. What Causes a Dog To Lick Himself Excessively? Allergies: Dogs with allergies have itchy skin and naturally tend to lick and chew their skin all the time. If your dog starts licking after being exposed to some sort of allergens, such as antibiotics for the skin, chemicals, cigarette smoke, pollen, food (yes - don't forget that dogs may also become allergic to their food), etc., then chances are she licks herself raw because the allergen is causing itch and discomfort to her skin. Fleas: Flea bites can cause extreme itching to a dog, especially if the dog is allergic to flea bites. One way for the dog to alleviate the itchy feeling is by licking, skin chewing, and scratching. If your dog is licking and scratching persistently, check to see if she has fleas. Other Skin Irritations: Other skin irritations, such as mange, ringworm, hot spots, hives, etc., can also cause excessive dog licking. Dogs often lick when they are in pain. When they are injured, they lick the wounds to promote self-heal by boosting blood flow. Also, licking creates moisture, which produces a form of topical anesthesia when it evaporates. They also lick their sore spots even if there is no open wound (e.g. sore joints, a pulled muscle). If your dog licks a particular area excessively and persistently, check to see if he has a cut, bruise, or swelling. Also, according to Dr. Dobias, DVM, dog collars can cause damage to the nerves supplying the front legs if the dog pulls constantly on the leash. This can lead to an abnormal sensation in the feet and dogs may start licking their front paws. Removing the collar (and using a harness instead) and treating the neck injury may stop the paw licking. 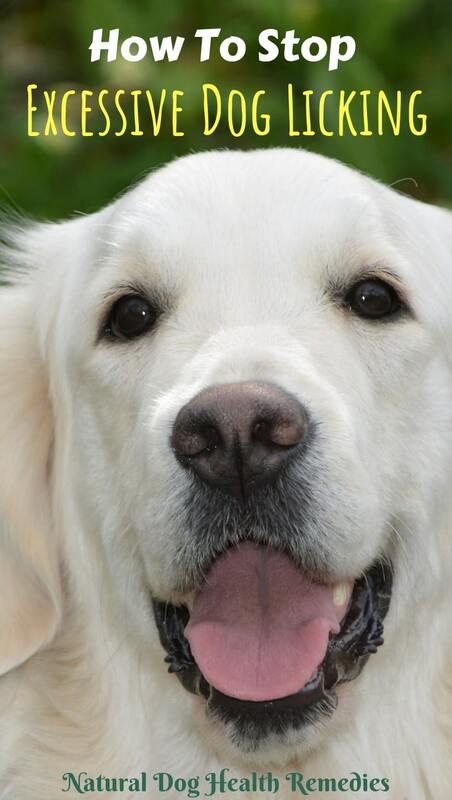 A dog may start licking as a result of some emotional problems, such as boredom, anxiety, stress, etc. Over time, this licking behavior can develop into an obsession. In extreme cases, this may cause baldness and skin lesions to form. It may be hard for us to understand, but it appears that some dogs are predisposed to certain obsessive-compulsive disorder. (If a dog is obsessed with licking but is otherwise healthy, the act of "licking" could be an OCD.) For example, doberman pinschers are known to lick themselves obsessively until they self-mutilate. Sometimes persistent and focused dog licking can cause hair loss, serious lesions and sores, resulting in a condition called lick granulomas (a.k.a. acral lick dermatitis). Lick granulomas can lead to hard-to-heal infections that can be extremely painful. If your dog continues to lick one specific part of his body excessively, pay careful attention and stop the licking before it causes damage. While you are working with a vet to figure out why your dog keeps licking himself, you can consider using some of the following natural remedies to help stop him from licking. As many dogs develop their licking habit out of anxiety or stress, calming herbs can be used to reduce the stressful feelings. Other relaxing herbs including St. John's wort, skullcap, and oat. 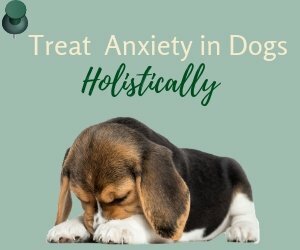 This remedy contains Oat, Skullcap, St. John's Wort, and more, and can effectively calm an anxious dog that exhibits unwanted behaviors such as licking. Many people have used homeopathic remedies to reduce stress-related licking with good results. Remedies that have calming effects include Chamomilla (from chamomile), Valeriana (from valerian root), and Ignatia (from St. Ignatius bean). 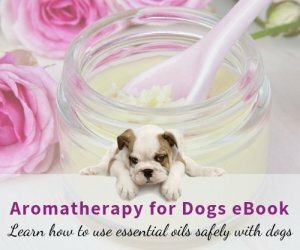 Animals respond to flower essences very well and these natural non-toxic essences are safe and easy to use. Some dog parents have found this Obsession Solution effective in stopping their pets' obsessive behaviors such as paw licking. If your dog licks himself constantly because of some kind of skin issues (e.g. itching, inflammation), try adding Omega-3 fatty acids (such as salmon oil) to the dog's diet. Fatty acids help recondition dry skin and stop itching and other irritations. Another great oil for skin issues that cause excessive licking is coconut oil, which is antibacterial, antiviral and antifungal. Add about one teaspoon of the oil per 10 pounds of body weight daily to your dog's food. Natural Diet: Some dogs who are fed commerical dog foods develop allergies, which cause skin irritations and of course excessive licking and scratching. 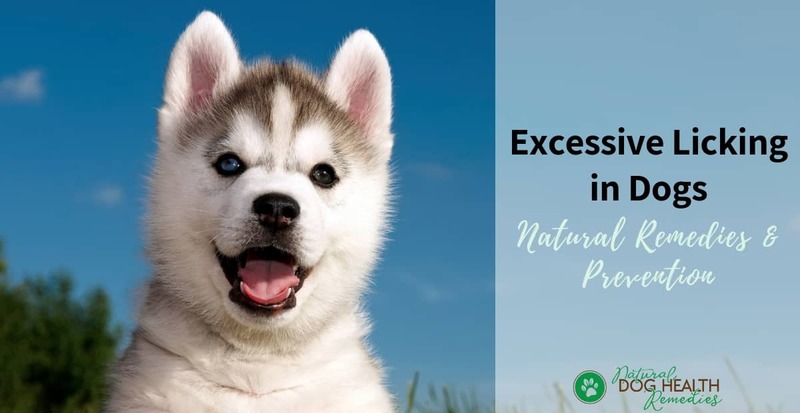 Feeding your dog a natural, wholesome diet free of artificial flavors and colors, with supplements added, can lessen the chance of developing skin irritations. Healthy wholesome food can also strengthen the dog's immune system, resulting in healthier skin and therefore less licking! Regular Exercise: Regular exercise can make your dog healthy. Exercise can also stimulate the dog's brain, release a lot of pent-up energy, and keep the dog happy. This will help stop the dog from licking himself raw out of boredom or frustration. Merck Publishing and Merial. The Merck/Merial Manual for Pet Health (Merck, 2007).